I have escaped to a tropical paradise just as it was starting to get warm in Maryland. A little over a week ago, Rick and I packed our considerable luggage and made the long journey to the country of Mauritius – a small island in the Indian Ocean (see map). We have set up camp (in an apartment) near the beach and are gradually adjusting to island life. 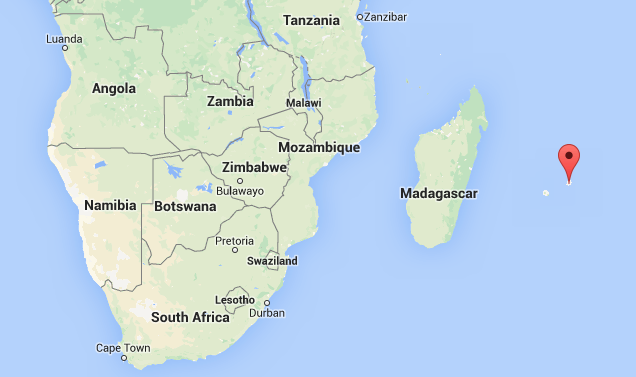 Map of Mauritius – see red dot. Most of you have probably never even heard of Mauritius – while it draws over 1,000,000 tourists each year, only around 10,000 of those are Americans. It is famous for its beautiful white-sand beaches, its tropical climate, and its mountainous landscape. It is also known as the former home of the dodo – the large, flightless bird that was driven to extinction within 100 years of its discovery by Europeans. La Preneuse Beach near our apartment in Mauritius. We will be here on and off for the next six months while Rick participates in a post-graduate course in Endangered Species Recovery. The course is organized by Durrell Conservation Trust and the Mauritian Wildlife Foundation (MWF) to teach students about the challenges of biodiversity conservation in the field. This week Rick has already come face-to-face with a number of the islands critically endangered species – pink pigeons, fruit bats, and fodys. These species are only found in Mauritius and were on the brink of extinction when Durrell and MWF stepped in to aid in their recovery. Just a few years ago, three of the island’s endemic bird species had less than 20 individuals living in the wild – now their populations are in the hundreds. 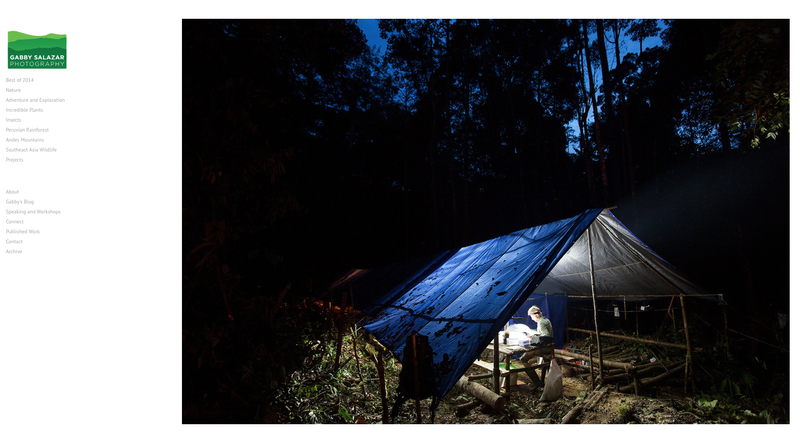 While Rick works on his course, I hope to document some of this pioneering conservation work as a volunteer with MWF. So what is life like in Mauritius? I must admit that we aren’t exactly roughing it. Our apartment is about 100 feet from the beach and a short walk from a grocery store. There seem to be wine shops and patisseries on every corner – clear evidence of the island’s long relationship with France. If you don’t want European fare, the island has wonderful Indian and Mauritian cuisine. On street corners you can buy rotis (flat Indian bread) stuffed with homemade chutneys for around $0.30 USD. 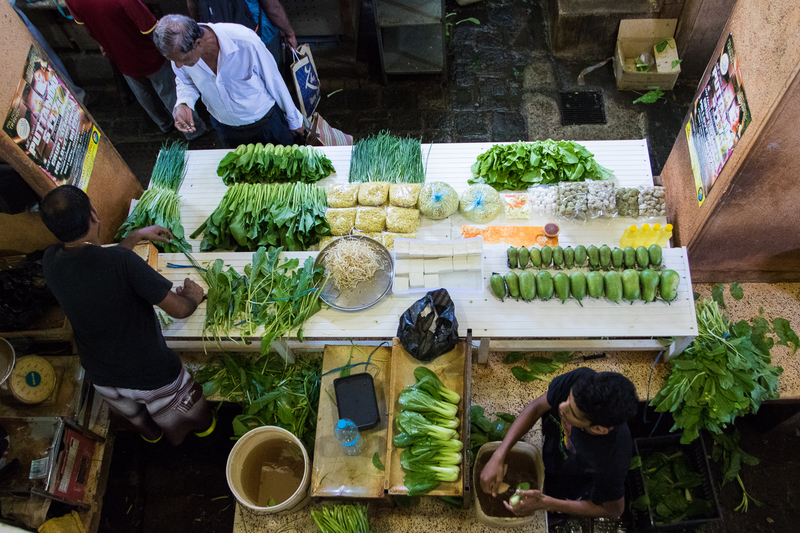 Food for sale at a market in Port Louis. The people here are wonderfully friendly. In one week, I’ve gotten to know more of my immediate neighbors than I did in two years in Pennsylvania. I already have plans to play tennis with one neighbor, to hike with another, and to have dinner with a nice family across the street. In the evenings, everyone ventures out to the beach to watch the sunset, greeting each other with a friendly “Bonjour” and a smile. We have also ventured out beyond our charming little village in our tiny rental car. They drive on the other side of the road here, so that has taken a bit of an adjustment. They also seem to have imported their driving patterns from India, so each trip feels like a true-life version of Mario Kart. Yesterday I woke up at 4:30am and joined a local group on a sunrise hike in Le Morne Cultural Landscape. 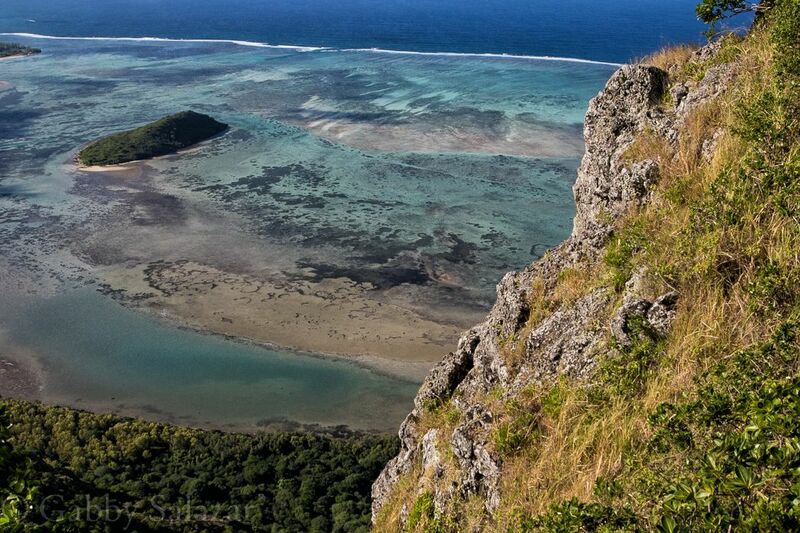 Le Morne is a UNESCO World Heritage site both for its environmental and cultural history. 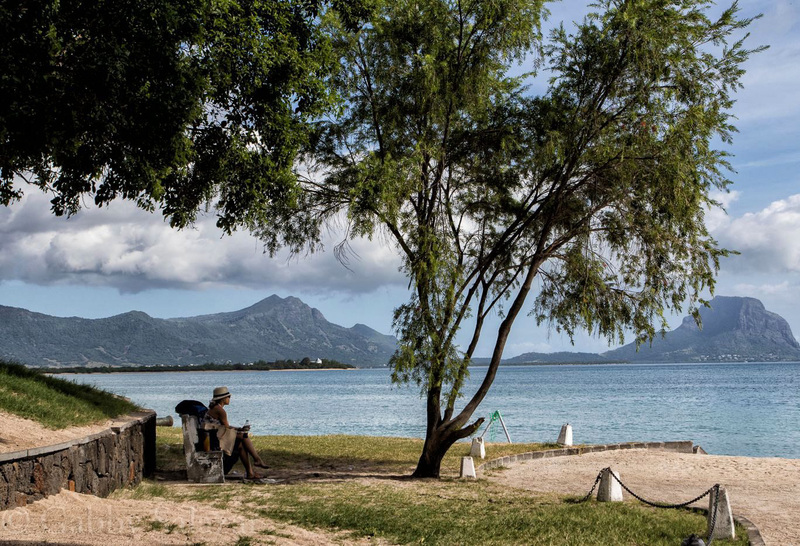 During the 18th and 19th centuries, it served as a haven for runaway slaves and has since become a symbol of freedom in Mauritius. I’ll write more about the hike later, but suffice it to say that the views simply took my breath away. I’ll write more soon about this little slice of paradise. Although I may just stay away from my computer – there is nothing like island life to cure the constant checking of emails and the stress of city life. I don’t yet know the word for it here, but I’m confident that “mañana” is one of the most used words/concepts on tropical islands. Want to see more photos? Follow me on Instagram at @gabbyrsalazar. 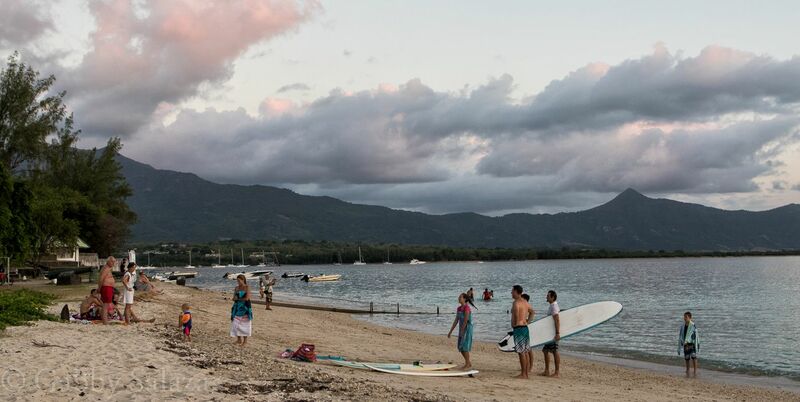 La Preneuse Public Beach in Black River, Mauritius. 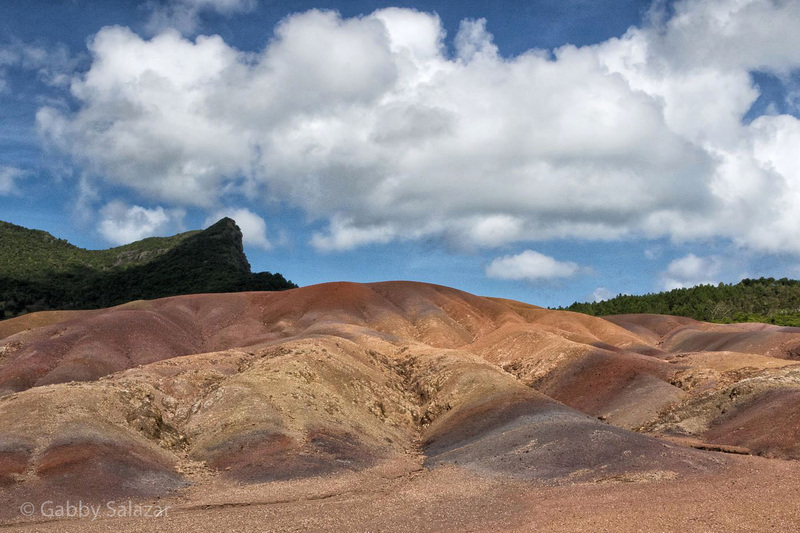 The seven colored earth of the Chamaral – a geological formation (basaltic rock turned into clay) that is a popular tourist attraction. What great shots! Can’t wait to visit!